Ericah posed in front of the Communications building, Oct. 2018. Life is good! It’s even better when it can be balanced. I have heard from many colleagues that college life is time-consuming. Since becoming a wife and mother, my days have been complete with lots of joy, love, and, well, many online journalism assignments. 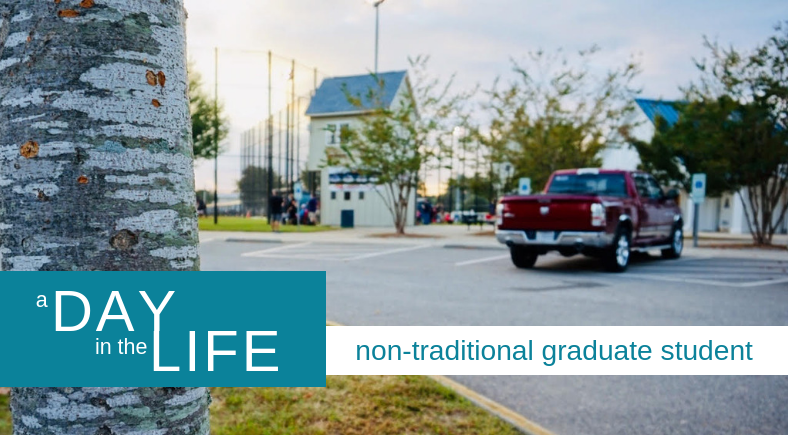 Here is a look into my life as a non-traditional graduate student; but first, what does a “non-traditional student” mean? In short, a non-traditional student is a person who likely does not have the flexibility to sit in on a lecture or attend classes. Perhaps you are more than 25 years old, work a full-time job, live off campus, or are financially independent. If any of these descriptions fit you, then you are a non-traditional student too. The best part of the day is waking up – it’s also the most important. I have been very much in tune with my Bible app these days. I find this app to be so helpful in centering my focus and also a great way to start a jam-packed day. The first thing I do after seeing my husband off to work is say a prayer, then I read the Scripture of the day. Reading the word daily tends to bring a sense of calmness into my busy life as a wife, mother, business professional, and graduate student. After my kids and I are dressed and fed, we are out the door and off to school. I kiss my four-year-old son and two-year-old daughter, as I give them quick pep talks. By the way, it never gets easier to leave them. I guess you could say that I just get better at dealing with it. I arrive at work and start my day with a steaming hot cup of green tea (Yogi is my favorite). For the next few hours, I am embedded in a stockpile of tasks. 10:00 a.m.,12:00 p.m., & 3:00 p.m. Breaks at work are golden. These are the times when I think the day is actually going somewhere. What to do on a break? Truthfully, I enjoy leaving from work knowing that I have accomplished professional and personal goals. This is the time that I say my goodbyes to fellow workers and head out the door, never to look back. Once picking up our children from school, we set out to do something fun as a family. If the weather is nice enough, we will go for a walk, but on fall days like this, we catch some recreational baseball. We like to entice our son into putting some of his highly robust energy in a sport, so taking him to a game is one of the surest ways to keep him interested in playing. Following a competitive game of baseball, you can find us parked at a local playground and living our best lives. I take this time to bond with my babies. They are in the stages where nothing matters really but love and affection. In this hour, I am very mindful of how fortunate I am to work a full-time job and complete each semester as a full-time honor student – therefore whenever I get a chance to, I hug my family tight. After all, I am reminded each day of how wonderful my other half is. He is the reason why I am able to achieve so much in a day. It is my honor to dedicate this time to my sweetheart because in the very active days as a graduate student I know that I am not alone. I dream about how the next day will be a whole new adventure. Ericah Jones is a contributor to the Daily Runner. September 5, 2018 Natalia Mittelstadt Comments Off on Join Moot Court!